It’s not every day that you have an epiphany. Mine came this past Wednesday as I drove to work. I realized that the World Wide Web itself is a great way to describe Buddhist impermanence and emptiness, two concepts central to the dharma. Maybe we can understand ourselves better by understanding the web. First, if you’re a computer scientist reading this, feel free to correct any mistakes I make. Just note them in a comment below. Here’s the thing. Unless someone printed this out and you’re reading it on paper, the words I’m writing now appear to you on a screen. You’re reading letters that become words that become sentences that become paragraphs that become a blog post. They are very real things and I wouldn’t be posting them unless I cared about the way you’ll receive them. I’ve added a headline at the top, a photo on the left (if your screen is wide enough for photo and words) and a video at the bottom to round out the blog post. It’s all set in a template that determines the type font and the colors and shapes you see and adds various elements of information on the right (again, if your screen is wide enough). This post is part of my blog, called Melting-Pot Dharma, which is built using software provided via the cloud by an outfit called WordPress, which is home to about 75 million blogs that produce more that 50 million posts a day. And, of course, the blogs facilitated by WordPress are just a portion of what has become known as the blogosphere. And the web is much more than the blogosphere. Google researchers have discovered more than one trillion unique URLs (web addresses). I read The New York Times every morning on the web, buy much of what I need on various sites, socialize on Facebook, watch videos, take part in video conferences, and use dozens of specialized sites to do my day job. It is all very real and feels permanent. When I write an insurance policy on the web as part of my day job, that’s a binding legal document. If three minutes later the purchaser is responsible for an auto accident, he or she will be covered. You can’t get any more solid than that. And yet it is not solid at all. It is impermanent and empty. 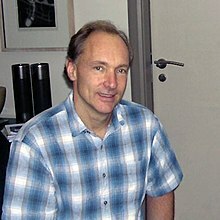 The web is built on a protocol written by Sir Tim Berners-Lee in late 1990. Like everything else computer-related, the web has just one building block, called a bit, with just two values, usually expressed as zero and one. The bit itself is a pulse of electrical energy. With no real understanding whatsoever of computer science to slow me down, I can keep this simple. Those pulses of electricity in zeroes and ones of different patterns and string lengths, originating from a WordPress computer server somewhere on earth, told your device to make the first letter of this paragraph a capital W and the next letter a lower-case i. The software on the server was also built from bits, as was the software on your device. So all of those bits had to interact with the hardware (server and device) to make those first two letters and everything else you’re seeing. They did a dance to make the letters, words, sentences, paragraphs and so on come out right. They did a dance to make the formatting and template correct and to arrange pixels on your screen in such a way that you’d see the photo above and even view the animation below. Those bits also tell your speakers, earbuds or earphones to play music as you watch the animation. All that based on electrical pulses with two values. So while this is very real and very solid to me, the blogger, and hopefully you, the reader, there is at the same time nothing real and permanent to it. The bits, left alone for a long enough time, will degrade and start to make mistakes. Some of the pixels won’t be quite right, but you won’t notice that for a long time. The bits representing the photo of Berners-Lee above are really not on the WordPress server but on a server used by Wikipedia. Similarly, the bits creating the animation below are on a Youtube server. Lots of things could make the photo or the animation disappear. As long as you and I are alive, we’ll remember parts of this blog, but memory is such that we’ll never remember it perfectly, and even our memories degrade over time. That’s impermanence. You and I and everything else in our world are like this web page. We are made of tiny particles that dance and degrade and even hop out of us into the air and water and other things around us. And eventually, the particles degrade and we die of old age, if nothing else killed us first. Everything we were will become absorbed by everything else in our world. This also helps explain emptiness. You can look at these words and the photo and the animation and see them as very real, but they are also empty of word-ness and photo-ness and animation-ness because they are nothing but the same two bits (zero and one) that all web pages share. Similarly, we humans are solid and occupy at least three dimensions, but I am empty of me-ness and you are empty of you-ness because we all share the same atoms and subatomic particles that dance within us and everything else in our world. It may seem sad at first, but it’s also beautiful, because knowing our emptiness shows us that we are all connected on one big network of particles. And that leads to another important Buddhist concept, interbeing. Nothing can “be” on its own. There is no me without you. Since this is the first time I’ve made an effort to express my “epiphany,” I hope that it worked and conveyed something of value to you. Please make a comment below if it did or if it left you scratching your head or screaming in consternation. And consider clicking the button to follow my blog. If your screen is wide enough, it’s above on the right. Yes this is perfect, a very down to earth and practical explanation of a very essential Buddhist teaching. Keep it up there is an entire world that needs enlightening!